Call takers and dispatchers from the NYPD, FDNY and Emergency Medical Dispatch services are located on the same floor in MetroTech Center in Downtown Brooklyn. Mayor Michael R. Bloomberg, Deputy Mayor for Operations Cas Holloway, Police Commissioner Raymond W. Kelly, Fire Commissioner Salvatore J. Cassano and Information Technology Commissioner Carole Post today announced the completion of major milestones in the City’s 911 emergency call system overhaul. 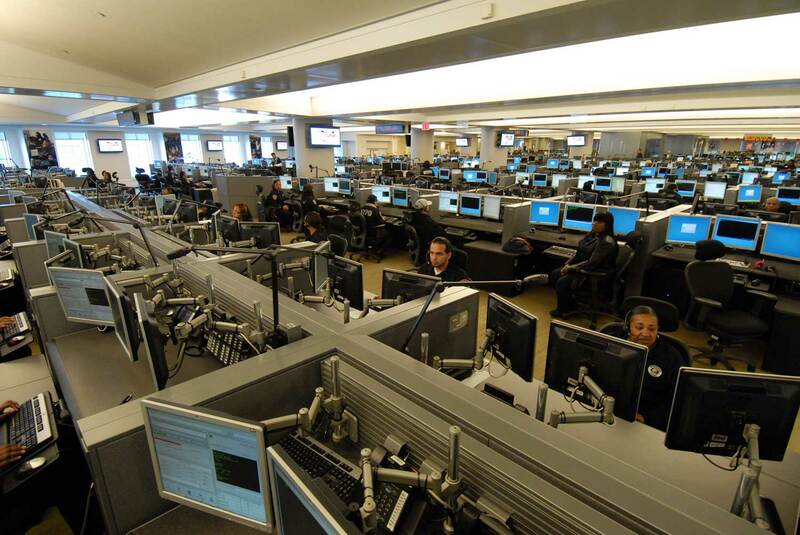 For the first time in city history, 911 emergency call takers and dispatchers from the NYPD, FDNY and Emergency Medical Dispatch services are located on the same floor and operating on the same technology, improving inter-agency communications and emergency response. The upgraded, state-of-the-art system has successfully been tested to handle 50,000 calls per hour, more than 40 times more than average daily volume and nine times more than the peak hourly call volume on September 11th. Further, the upgraded system now provides call takers with onscreen maps of the caller’s location and the upgraded system provides critical redundancy to the City’s emergency communications infrastructure to ensure delivery of the more than 11 million 911 calls received each year. The Mayor made the announcement at the City’s Public Safety Answering Center, located in MetroTech Center in Downtown Brooklyn. All of the City's more than 1,500 call takers are now using the same technology for the first time. Integration of NYPD and FDNY computer aided dispatch systems allowing 911 operators to automatically route an incident directly to the FDNY via a data link. Improved data sharing among agencies - including the immediate availability of emergency data to the NYPD, FDNY and EMS - and allowing better coordination of resources directed to the scene of emergencies. Modern, state-of-the-art telephony - maps indicating the location of callers are now automatically presented to 911 call takers, lending to improved accuracy and speed the in dispatch of emergency resources. Upgrades to the City's emergency telephone and radio networks, strengthening the backbone of emergency communications infrastructure and affording the City backup capabilities that have never before existed. Installation of Automated Vehicle Locator technology in emergency response vehicles. Renovations and upgrades at One Police Plaza, which houses will house a redundant emergency 911 operations for the NYPD. Renovations and upgrades at existing communications offices in Queens and the Bronx, which will house backup emergency 911 operations for the FDNY. The move of all NYPD 911 call takers and dispatchers onto the third floor of Public Safety Answering Center in Brooklyn was completed last month, where they joined the FDNY personnel who moved there in August 2009, and the Emergency Medical Dispatch personnel who moved there in June 2010. The upgraded system employs two new fully dedicated and networked telephony digital switches, and the full system has been successfully tested to handle a total of 50,000 calls per hour. The new system presents emergency calls on a VESTA intelligent screen, with call takers now receiving automatic displays of location and telephone phone number of the caller, and automatic mapping of the caller's location. In addition, call recording is integrated, which allows instant playback of the call. As of New Years Day, the City has received over 1.2 million 911 calls on the new VESTA system. The 911 system upgrade created new layers of redundancy and resiliency in all areas of the 911 operation through new technology and operational efficiencies. The system now has standardized relevant technologies across agencies, including enhancements for Computer Aided Dispatch and telephony. The second major phase of the project is the ongoing construction of the City's Public Safety Answering Center II facility in the Bronx, scheduled to be completed in 2015. The second call answering center will create redundancy and diversity in the system and will operate in conjunction with the current facility in Downtown Brooklyn, with each having the capacity to support the entirety of the City's 911 operations in the event of an emergency. An overall lack of efficiency and collaboration illustrated by the "silo-based manner" in which each emergency services agency managed its operations through the use of separate facilities, telephony systems and supporting technologies. The telephone systems at three central offices and the Police Department's Brooklyn call taking center lacked the ability to recover from a severe emergency such as the blackout or a service interruption; backup power resources failed; and call taking capacity was inadequate for the unprecedented call volumes during the early hours of the event. Archaic technologies and deteriorating infrastructure led to fragmented accountability among City agencies. The Emergency Communications Transformation Program began in 2004 and was designed to address these and other shortcomings in the City's emergency public call taking and dispatch operations. New York City first launched the 911 system in July of 1968, enabling the public to dial 911 for emergency police response for the first time ever, rather than calling the main number for the NYPD. The 911 service was expanded to include fire and emergency medical calls five years later.